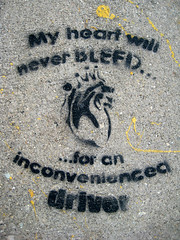 The ever-observant Olive Talique has snapped us a photo of this fresh bike path stencil. While I agree with her that the "Up with bikes! Down with pants!" is definitely a favorite, this one, though slightly more cynical, is definitely up there. This reminds me of a very recent article in the Capital Times called "Pedestrians and drivers: mortal enemies" - an interesting look at the interactions between drivers, walkers, and bikers in the city. The comments section is its own world of fascinating argument over who's more at fault. A helpful tipster has informed me that the MPD are conducting a bit of an investigation into some recent graffiti - no word yet on the specifics, but the "Investigative Services Department of the Dane County Sheriff's Office, who are assisting the Madison PD" are attempting to question people with some history of graffiti work. Now might be a good time to bone up on how to effectively deal with the po', as it were. Keep a cool head, and be aware. On a nearly completely unrelated note, I am compelled to post this video of a recent Banksy installation in New York City. I know, I know, it's not Madison or even close, but it's still really cool art, and I don't currently have any good Madison-area photos to share. So sue me, I'm working on it! NOTCOT: Banksy's Village Petstore & Charcoal Grill from Jean Aw on Vimeo. This lovely photo comes courtesy of Mando Photography, and was taken of a laundromat on S. Park St. here in Madison. Now this is what I call good use of commercial wall space. Anyone know who the artist is? 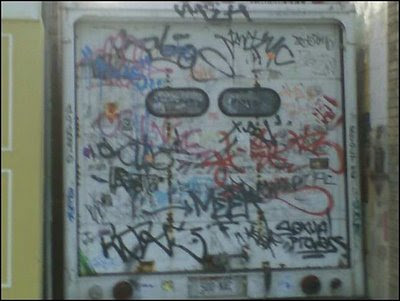 Sender-inner Michael alerts us to the presence of this presumably stuck truck in a small alleyway near King of Falafel in downtown Madison. I've passed this very truck myself, and kicked myself for not taking a picture of it. Michael offers us this cell phone cam glimpse of the extremely tagged back-end. I might go by and get another, clearer shot of it, too. Certainly adds an interesting splash of color to the neighborhood. 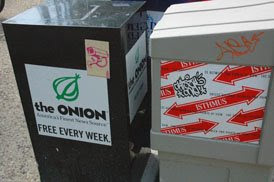 Apparently, picking up a free copy of the Onion on the square is a dangerous, well-watched proposition. The people are rebelling, however, by claiming Isthmus as their own.